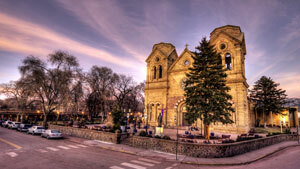 Santa Fe is the capital of New Mexico and is known as “The City Different”. There are many effective advertising opportunities throughout the city due to the multicultural background of the city appealing to many different people. Out-of-home advertising near cultural attractions such as the New Mexico Museum of Art and the Georgia O’Keeffe Museum would allow you to potentially gain new customers. Target your audience during annual events such as the Fiestas de Santa Fe which draws in thousands of visitors every year. The major highways serving Santa Fe also provide billboard possibilities. Billboards on I-25 or US 84 would generate high traffic exposure of your business. Zip Codes: 87501, 87502, 87503, 87504, 87505, 87506, 87509, 87592, 87594.